By recognizing early-on the need for integrating audio and video content from the iPod® and iPod touch® into residential A/V systems, iPort created the industry standard for playback and control of iPod content. iPort is the only iPod and iPod touch solution that works seamlessly with a wide variety of single and multi-zone audio/video and home automation systems. iPort provides integrators the ultimate flexibility for including iPod and iPod touch as audio and video sources in their projects. The iPort IW-21’s RJ-45 modular connections delivers unbalanced audio and video up to 30 feet, for use with local-zone audio/video systems. 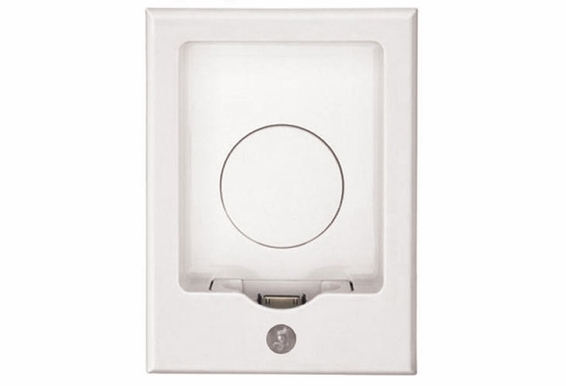 IR capability via the illuminated LED on the faceplate allows control of the volume and essential iPod menu and playback functions by an optional iPort EX-1 remote. The included wall plates provide stereo RCA audio and a composite video connnection for output of iPod video content. 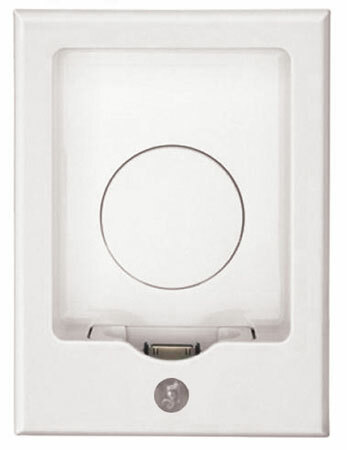 The IW-21’s front panel features a lighted status indicator and is designed to accept all Apple dock connector iPod models. It includes a back support, — a rubberized adjustment disc that compensates for the varying thicknesses of different iPod models. Optional Balanced Audio Upgrade Kit delivers video up to 500 feet from the iPort. Optional Balanced Video Upgrade Kit delivers video up to 500 feet from the iPort. Optional RS-232 Control Upgrade Kit enables two-way communication and control of the iPod/iPod touch via compatible control systems (requires Balanced Audio Upgrade Kit).